Sintons warmly invite you to join us for our 2019 Charity Golf Day, in aid of our firm charity Daft as a Brush. Daft as a Brush Cancer Patient Care provides staffed custom-made vehicles to transport outpatients who are undergoing Chemotherapy and Radiotherapy cancer treatment, free of charge, to and from Hospital, across Northumberland, North and South Tyneside, Durham, Newcastle upon Tyne and surrounding areas. 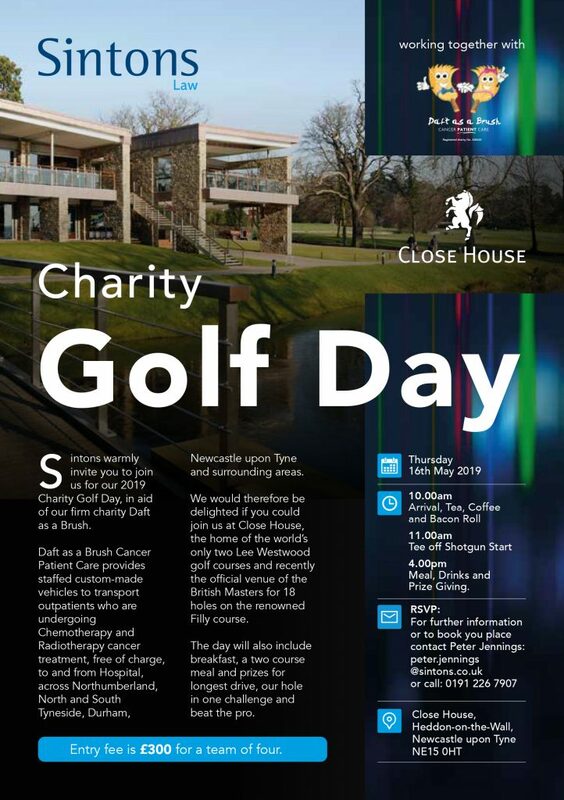 We would therefore be delighted if you could join us at Close House, the home of the world’s only two Lee Westwood golf courses and recently the official venue of the British Masters for 18 holes on the renowned Filly course. The day will also include breakfast, a two course meal and prizes for longest drive, our hole in one challenge and beat the pro.